The agreement will be celebrated on campus with an academic conference jointly sponsored by the two institutions, an exhibition of materials from the Biblioteca Apostolica, and a concert of sacred music featuring music from manuscripts in the Vatican Library’s holdings. 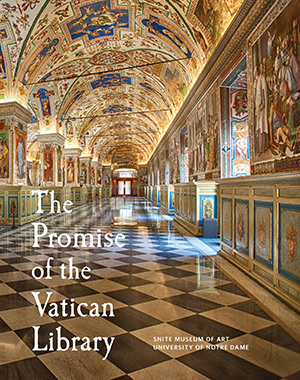 The conference, The Promise of the Vatican Library, will be held from May 8-10 in Notre Dame’s McKenna Hall. Among conference speakers discussing holdings of the Vatican Library and opportunities for future research will be Archbishop Bruguès; Carmela Vircillo Franklin, professor of classical studies at Columbia University; and James Hankins, professor of history at Harvard University. An exhibition of materials from the Vatican Library will be held May 8-22 in the Milly and Fritz Kaeser Mestrovic Studio Gallery of the Snite Museum of Art. The exhibition of manuscripts, printed books, maps and drawings will include Galileo’s 1610 astronomical treatise, “Sidereus Nuncius,” the first published scientific work based on observations made through a telescope; a 13th-century manuscript commentary by Albertus Magnus on Aristotle’s treatise on nature, “Parva Naturalia”; and a 16th-century Mass composed by Josquin des Préz, which represents the introduction of movable type for printing music. Vestigia Vaticana, an exhibition of books and manuscripts from the Middle Ages through the modern era, including papal bulls and documents, papal book bindings and representations of the Vatican in print, will be held in the Hesburgh Libraries’ Rare Books and Special Collections rooms May 5 through Aug. 15. A concert of sacred music featuring music held by the Vatican Library will take place at 4 p.m. May 10 (Tuesday) in the Basilica of the Sacred Heart. The concert, “Penitence and Praise: A Concert of Sacred Music in Italian Libraries,” will include music from des Préz’s Mass as well as works by Domenico Scarlatti and Antonio Vivaldi. The Vatican Library’s holdings today include some 80,000 manuscripts; 100,000 archival documents; 1.6 million printed books, including nearly 9,000 incunabula, 150,000 prints, thousands of drawings and plates; over 200,000 photographs; and 300,000 coins and medals, among other items. The manuscript collection includes such invaluable materials as the “Codex Vaticanus” of the Bible; the “Vergilius Vaticanus,” containing fragments of Virgil’s Aeneid; the “Dante Urbinate”; and other manuscripts that are used to produce modern editions of countless ancient texts. Originally published by Michael O. Garvey at news.nd.edu on April 28, 2016.